Comprising Whitney Duncan, Ashlee Hewitt and Shelby McLeod, April 13th saw new country group Post Monroe release their debut self-titled EP. With a co-producer credit for Lady Antebellum's Dave Haywood, the announcement of this EP immediately intrigued a lot of people and the finished product doesn't disappoint. At it's simplest, the EP merges the 'southern' gritty vocal tone of the trio with a mix of country, pop and soft rock styling that showcases the various sides of the trio. The real gem on this EP is, without a doubt, Lucky One. The strong opening drum and electric guitar combination sets up an edge to the track that helps to create a dramatic overall rocky feel. Lead vocals on the track come from Whitney and the gritty overall sound really suits the trio's distinctive voices. Lucky One also holds some of the strongest lyrics in the release, lines such as "I am stronger for the things you put me through" delivered with just the right amount of vocal attitude. There are two tracks on the EP that play more to a country-pop sound, Red Hot American Summer and Dixie Dust. Red Hot American Summer is the lead single however in my opinion Dixie Dust is the stronger of the two tracks. Led by Shelby, the track seems like it will be very popular live, it has a very listenable quality behind it that is sure to draw listeners in. The drum line provides a solid beat for the track as additional instruments fade in and out, you are sure to find yourself tapping your feet along to the catchy melody. Whilst still developing a rock influence, it feels as though EP opener Half Hearted is one of the more obviously 'country' tracks on the release. Opening with a slick showcase of the trio's harmonies, the track's driving rhythm will, as with Dixie Dust, inevitably see you tapping your feet along to the beat. Perhaps the most harmony-centric track on the EP, there is interestingly only a short section that does not feature all three voices singing together. Focused around "if you're gonna love me don't love me half-hearted", the lyrics build a story that is sure to be relatable to a lot of listeners and sees another strong vocal delivery from the trio. 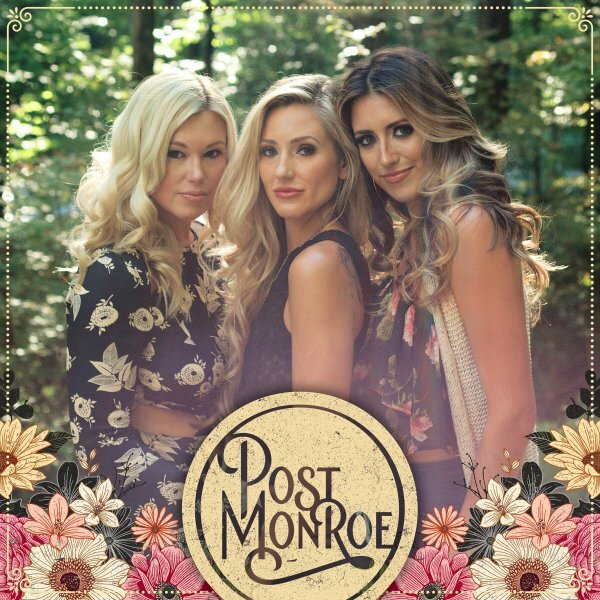 This is certainly a very impressive start for Post Monroe, the trio have very tight harmonies and each is talented in their own right. The only frustrating point I found is that after a while, whilst every track is strong on it's own, you find yourself wanting to pull back both the vocal (particularly in the chorus) and the instrumentalisation as a whole. It'll be interesting to hear what would be released in a full album from the trio, even the slower, balladic tracks on this EP are still relatively heavy instrumentally so it would be great to hear them really strip all the production down. That being said, this release is still definitely worth a listen, it is undoubtedly a promising start! Labels: Post Monroe "Post Monroe"